I am constantly inspired by my clients. Several months ago a young man showed me the power of being truly committed to living with an open heart. His girlfriend had just ended their relationship a few days before his session. She had been overwhelmed by multiple life challenges and had decided she just could not be in a relationship anymore. His intention for the healing was to keep his heart open as he processed the breakup. This meant that even though he was experiencing an enormous amount pain, he did not want to emotionally shut down or project anger toward his former lover. He was consciously and courageously choosing not to create a story around the incident to protect himself; that she was bad and he was a victim. He wanted to hold the whole situation in love. It was a profound and powerful healing. Many old beliefs, fears, and emotional wounds came up to be cleared. It was also interesting to note that his commitment to keeping his heart open appeared to pay off. The weeks that followed the session were abundant in almost every aspect of his life. Maybe the clearing of old patterns allowed him to receive more. Whatever the reason, the universe opened up for him creatively, emotionally and financially. Since that session, when I start to feel myself becoming judgmental or emotionally closing down, (like after I listen to the news) I remember the courage of my client. Are Healers Really Flow Hackers? I’ve been reading and thinking about Flow. To use Jason Silva’s descriptions from the first video below, it’s that state in which time slows down or speeds up, self vanishes, action and awareness merge. Flow is an effortless state that silences our inner critic. As a healer, I call Flow “sacred space”. Sacred space is where healer and client become one, where there is no time, where the more “I” get out of the way, the more effective the session. I am part of a community of Healing Touch Practitioners who live and work throughout the Bay Area. This community is a continual source of inspiration and support for me in my healing practice. Today I would like to share an article written by my colleague Laurie Ratto,“Healing Touch Helps Those with Cancer”. Laurie Ratto has a private Aromatherapy and Healing Touch Practice in Alameda, California. She is also a RN. In this article Laurie mentions our volunteer work as Healing Touch Practitioners at the Charlotte Maxwell Clinic. While she writes about my success with neuropathy in my private practice, it was one of Laurie’s sessions at Charlotte Maxwell that made me first realize how beneficial Healing Touch could be for my clients going through Chemotherapy. I am not an isolated healer. I am part of a dynamic, enthusiastic, heart-centered group of healers who are creating a new paradigm of possibilities. These are exciting times. In my healing practice I have watched Healing Touch sessions make a remarkable and dramatic difference in the lives of my clients who were going through chemotherapy and radiation. Because of this, I would like to see every person with a cancer diagnosis have access to Healing Touch treatments. That’s why I have been a volunteer at the Charlotte Maxwell Clinic in Oakland since 2008. The Charlotte Maxwell Complementary Clinic (CMCC) is a state licensed primary care clinic and a community of healthcare practitioners dedicated to bringing low-income women alternative healthcare. Designed to work alongside the services of a primary care physician, CMCC is also a center where women with a cancer diagnosis can find consistent physical, emotional and spiritual support through healing modalities. The Charlotte Maxwell Complementary Clinic was named after social worker Charlotte Maxwell, who died of ovarian cancer in 1988. Charlotte was an extraordinary woman who found that complementary therapies greatly enhanced the quality of her life, especially in the final months. Her healthcare practitioners were so inspired by her spirit that they founded The Charlotte Maxwell Clinic. 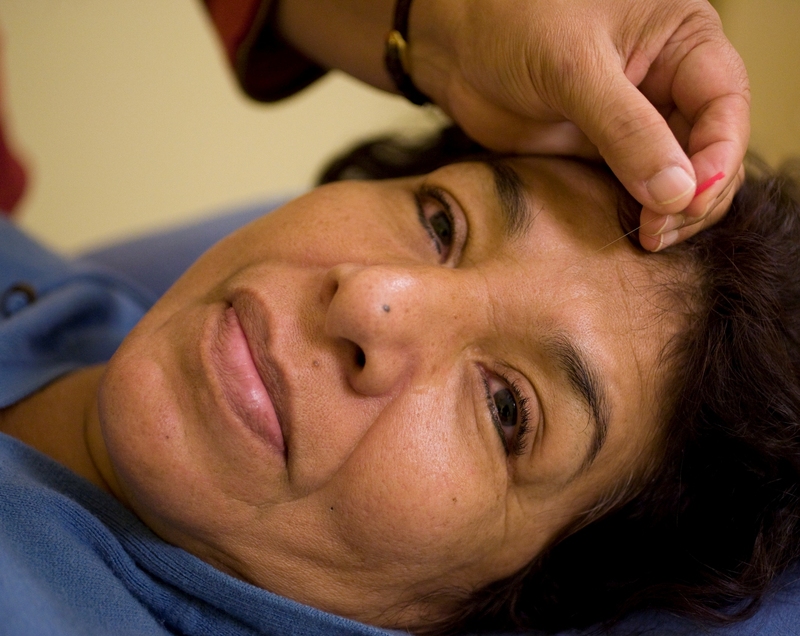 They wanted to make acupuncture, energy work and other complementary modalities accessible to women who otherwise would not be able to afford them. Navigating our healthcare system, even with insurance and a strong emotional and financial support system, can be overwhelming. Navigating our healthcare system without insurance can be devastating. At CMCC, it is so rewarding to see a women who looked fatigued and exhausted, walk out or her Healing Touch session with a smile on her face so much more relaxed. At CMCC I have worked with women of all ages and diverse cultural backgrounds. I find it so exciting to work in a clinic where the value of complementary modalities is understood and put into action in the community. The Charlotte Maxwell Clinic is a working model of how people with cancer are benefiting from alternative medicine in our healthcare system. Volunteering at CMCC is a rewarding experience. As a volunteer, I received a weekend of orientation and training, and was then scheduled for one shift a month with clients. I see three clients during my shift. I get there thirty minutes before my first client to look over the medical charts. Everything about the client is in the charts: when she was diagnosed, what kind of cancer she has or had, what Western treatments she is currently going through, and any contraindications. I can look at what modalities or treatments the client has had in the past and read the notes from those practitioners. If the woman doesn’t speak English, that is also in the file and the clinic usually provides a translator. Sessions with clients are 50 minutes each. At the end of each shift all practitioners and staff support gather to check in. Check-ins have been extremely educational for me. I have learned so much more about cancer and the current Western medical therapies. By listening to the other practitioners, I have also learned the amazing benefits of other complementary modalities such as Acupuncture, Chinese Herbs, Jin Shin Jyutsu, Therapeutic Imagery, Feldenkrais and Western Herbs. At the check-in, if circumstances warrant it, practitioners can write referrals for their clients to the CMCC staff. This could be for a woman who needs special preparation before an upcoming surgery or a client who needs special care due to an infection. Appropriate staff members will then call the client and make sure the client is taken care of. The Charlotte Maxwell Clinic also has presentations and workshops for volunteers on each modality the clinic offers and lectures on topics such as “The Basics of the Biology of Cancer.” I attended two separate talks on chemotherapy by oncology nurses from the Bay Area that have been extremely helpful while working at the clinic and in my private practice. Since volunteering at The Charlotte Maxwell Clinic I can picture how our healthcare system can integrate Healing Touch and other complementary modalities into our medical culture. It is inspiring to work in a community with so many caring and committed women coming together to help each other. Working at Charlotte Maxwell gives me the hope to believe we can change our healthcare system to a culture where everyone is cared for emotionally, physically and energetically. The Charlotte Maxwell Clinic has an office in San Francisco and an office in Oakland, California. To find out more and to support the work of CMCC click here. Jeri Lawson is a Healing Touch Practitioner and Clarity Breathworker in the Temescal Area of Oakland, California. The Haelen Center is a wonderful Healing Touch Clinic in Lafayette, California. Haelen is a Greek word for wholeness and you can feel the fullness of the energy as soon as you step through the front door. I have always wanted to volunteer at Haelen and last Saturday I finally made it happen by telling myself it was time to write a post about it. The Haelen Center is in the peaceful home of Martha Engelbert. She has a Baltic Wheel labyrinth made from gravel and brick as part of her beautifully landscaped grounds that you can walk before or after your session. There is a nice shot of the labyrinth in a recent article in the Lamorinda Weekly. The Center is open the second and fourth Tuesdays of the month with two appointment times. The first is at 9:00am and the second is at 10:45am. On the first and third Saturday of the month there is one session at 9:00am. There can be as many as four people at a time receiving a Healing Touch Session and all sessions are done in separate rooms, giving the healing recipients complete privacy. Sessions last from 45 to 75 minutes. 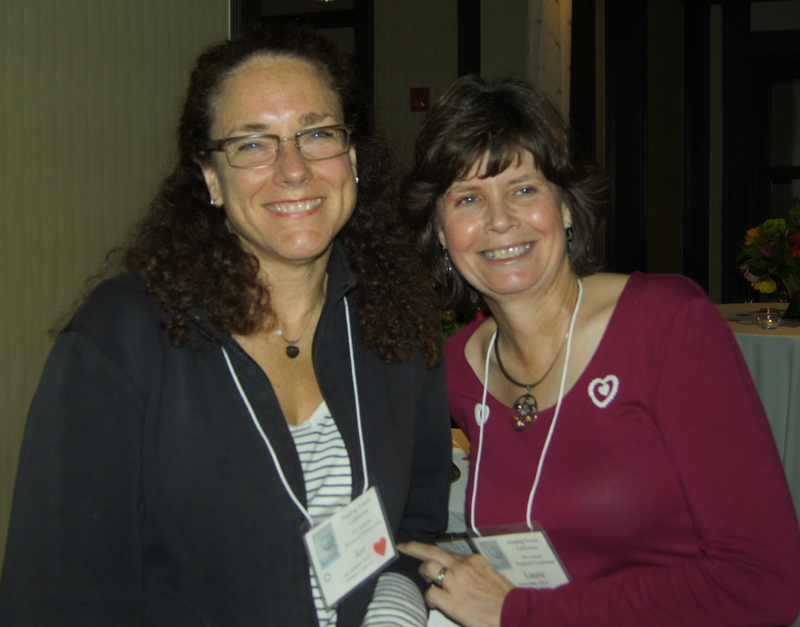 Two amazing women run the Haelen Center: Martha Engelbert and Suzanne Mittica, a Certified Healing Touch Practitioner. The clinic is well organized and efficient. All Healing Touch sessions are documented and all client files are kept confidential and secure in a locked cabinet. 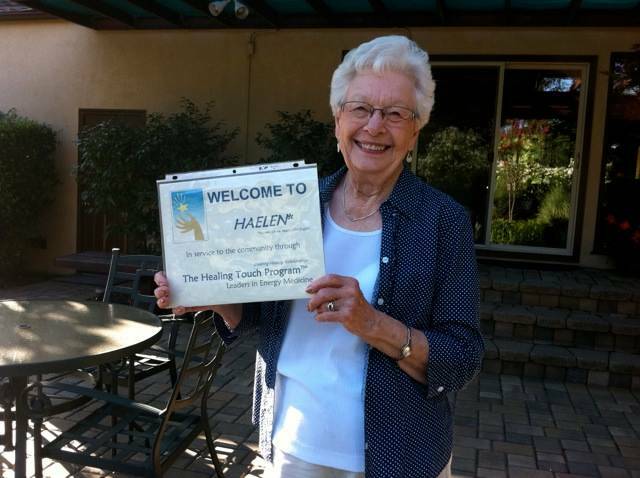 All volunteers at The Haelen Center have been trained by the Healing Touch Program™ and adhere to the program’s Code of Ethics and Standards of Practice. They are dedicated to serving the surrounding community. They do not charge for their services. Donations are not expected. When given, they are welcomed and used to cover expenses benefiting clients. Call Martha to schedule an appointment at 925-935-6236 and receive directions to The Haelen Center. The community of Lafayette, California is quite fortunate to have such a life affirming center like Haelen.